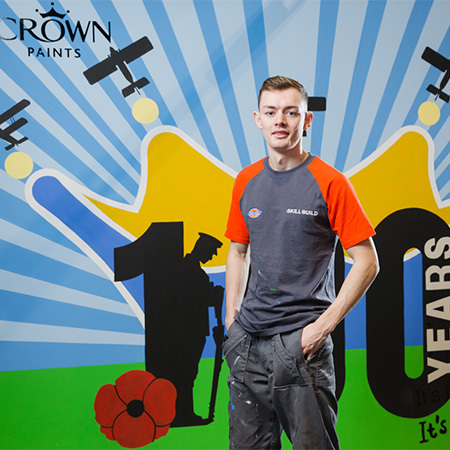 Aiden Dearie has been chosen as the gold winner of the 2018 Crown Paints Apprentice Decorator of the Year competition after a gruelling three-day challenge at the WorldSkills UK LIVE event at Birmingham’s NEC. The final included seven regional winners against each other as they undertook a timed challenge which consisted of completing a design which commemorated the 100 year anniversary of the signing of the Armistice Agreement, marking the end of the First World War. The artwork was devised by Crown’s in-house design studio specially for the competition. During the final, each apprentice had 18 hours in total to complete the challenge under the watchful eye of the competition’s panel of judges, including Kevin O’Donnell, Crown Paints’ training manager, Sandie Webster and Ben Deer, both former Crown Paints Apprentice Decorator of the Year winners. Aiden, a 22-year-old apprentice who is completing his SVQ Level 3 Painting and Decorating at City Building Glasgow’s Queenslie Training College demonstrated excellent attention to detail. The judges praised his skill with both matt paint and trim work, and for completing the design well within the timeframe to an exceptionally high standard.